On January 27th, we will experience the new postal rates. This will affect all sort levels and classes of mail and should be considered for all 2019 budgeting. 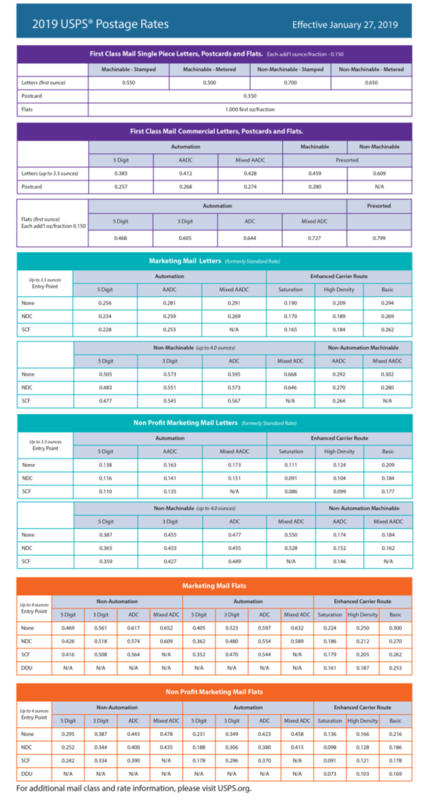 Below is a summary of some of the changes to first class mail and a chart detailing rate changes for the primary categories that affect our clients. Customers who print postage online, the Metered Mail rate will now be a 5 cent discount compared to the Post Office price with rates increasing to $0.50 in 2019 from $0.47 currently.